Within Teamwork Projects, when using board view you can choose how you would like your information to be displayed. You can find Manage columns under the options button on the right side of the task area. 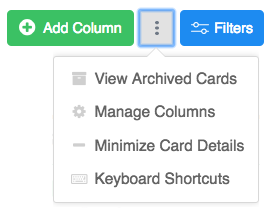 When managing columns you can choose whether to apply the changes to all your columns or a select few. You will also find the option to choose default columns to add new cards to. Minimal - which will show the the task and assignee. Default - which will show the task, assignee, dates, priority and attachments. Custom - you can select which items you would like to include on your board which you can find below. One you have updated your preferences ensure to select to green Update button to save your changes.